U.S. stocks bounced back from the biggest one-day sell-off of the year Tuesday, as investors cheered a full slate of corporate results and economic reports. 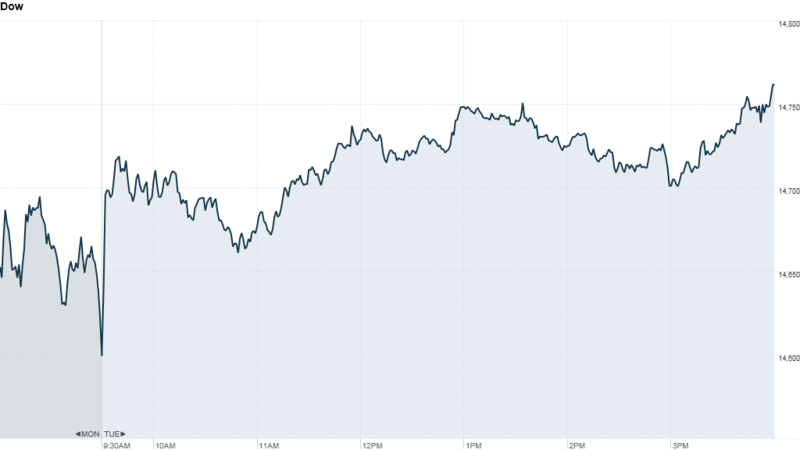 The Dow Jones industrial average jumped more than 150 points, or 1.1%. The S&P 500 added 1.4% and Nasdaq rose 1.5%. The rebound comes one day after all three indexes declined sharply, following weak economic news out of China and two explosions in Boston. Housing recovery: Investors were encouraged by housing starts, which topped 1 million in March for the first time since June of 2008. Building permits came in at an annual rate of 902,000 in March. That was slightly less than forecasts but still solid. Homebuilder stocks spiked, with PulteGroup (PHM) rising more than 4%, Hovnanian Enterprises (HOV) adding 1.6% and Lennar (LEN) rising 2.4%. Meanwhile, the Consumer Price Index slipped 0.2% in March, more than the 0.1% decline that economists expected. Core CPI, excluding food and energy prices, rose 0.1%. The CPI report is the latest to show that inflation is not a problem right now, which means the Federal Reserve may be able to continue its quantitative easing program of bond purchases for some time. 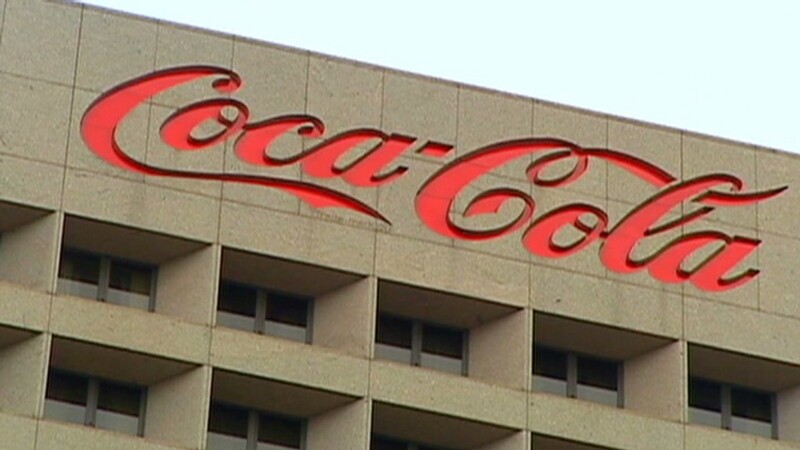 Strong earnings roll in: Coca-Cola (KO) shares jumped nearly 6%, leading gains on the Dow and S&P 500, after the company topped earnings and sales forecasts. Johnson & Johnson (JNJ) shares gained modest ground after the company's first quarter earnings also exceeded expectations. Goldman Sachs (GS) reported solid results, but the bank's shares slid almost 2% as investors worried that Goldman may be taking on too much risk to deliver such strong earnings. Tech giant Intel (INTC) reported after the closing bell. The chipmaker's revenue topped forecasts and the company also issued strong sales guidance. Shares of Intel rose in after-hours trading. Yahoo (YHOO) also reported earnings after the bell. The company's revenue was below estimates but it still reported higher-than-expected earnings. Shares declined slightly in after-hours trading. In other corporate news, Target (TGT) shares pulled back after the discount retailer lowered its earnings and sales forecast, blaming seasonal factors. J.C. Penney (JCP) shares spiked after Bloomberg reported that the struggling retailer may borrow against its real estate holdings to raise cash. Gold regains some luster: Gold rebounded Tuesday, a day after prices tumbled 9% to a 2-year low. Gold prices gained almost 2%, settling at $1,387.40 an ounce. Other commodities were mixed. "I think yesterday's decline, in both commodities and equities, may have been overdone, so we're having a bit of a rebound," said Peter Cardillo, chief market economist at Rockwell Global Capital. Boston remains in focus: The Boston bombings have "a minimal economic impact, but a very large emotional impact in the marketplace," said Lazard managing director Art Hogan, who was working in Boston at the time of the attack. "This is a harsh reminder that we live in La very dangerous world." European markets closed with modest losses on concerns about slowing global growth, while Asian markets ended mixed. The Nikkei dropped 0.4%, the Shanghai Composite added 0.6% and the Hang Seng fell 0.5%. The dollar dropped versus the euro and the pound, but climbed versus the Japanese yen. The price on the 10-year Treasury yield fell, pushing the yield up to 1.72% from 1.70% late Monday.